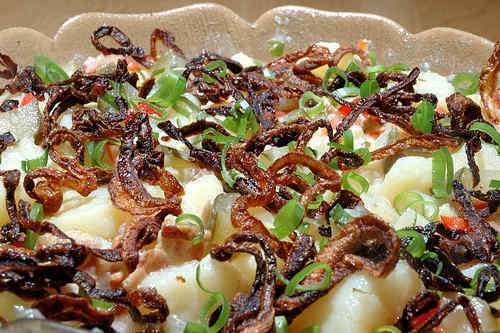 There are many variations of German potato salad ("Kartoffelsalat"). Mine has bacon, pickles, bell pepper, onion, garlic and chicken or beef stock, but no mayonnaise or eggs. Place potatoes in pot and cover with cold water. Set on medium heat, cover and bring to a simmer. Reduce heat. Keep covered and simmer until done, depending on the size of the potatoes, ca. 15-20 minutes. Check for done-ness with fork. Make sure to not overcook, otherwise you will end up with mashed potatoes instead of potato salad. Render bacon in heavy pan over medium-high heat until crisp and brown. Remove pork fat (it would solidify when the potato salad is cooled down). Add 1 tbsp of oil. Add chopped onion but retain 1 tbsp. Cook over medium-high heat until onion is lightly browned. Add garlic, cook for another minute, turn off heat. When the potatoes are done, bring the stock to a boil. While the stock is heating up, peel the potatoes and cut them into thick slices. In a large bowl, stack alternate layers of potato slices and layers of bell peppers and pickles and bacon-onion-garlic mixture. The layering will reduce the amount of stirring required, so the potato slices won't break up too much. Add the 3 tbsp of vegetable oil, parsley, dill, remaining raw onion, salt and pepper to the bowl. Stir the mustard and the horseradish into the pickling liquid. Pour over the potatoes in the bowl. Pour the hot stock over the potatoes. Mix carefully. Adjust seasoning with salt and pepper. Garnish with chopped scallions and caramelized onion rings (optional). Serve cold.